This creamy cucumber salad is so refreshing for summer! 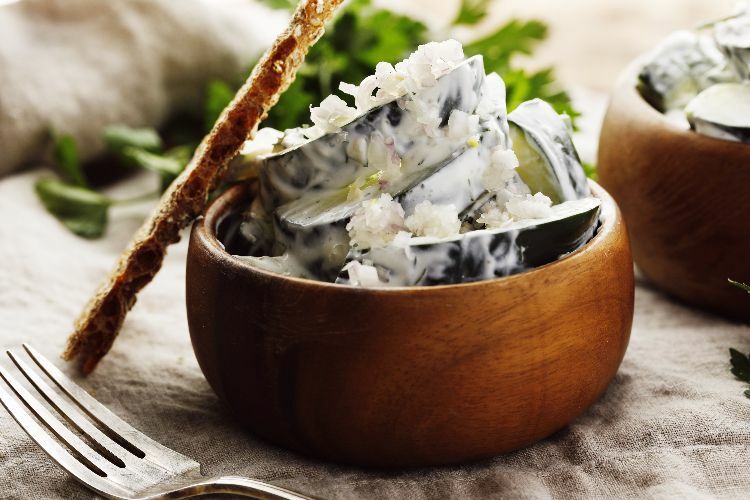 It features cucumber slices topped with an herbaceous dressing made with a combination of sour cream and crème fraiche. The resulting recipe is just the right side dish for a barbecue or cookout. This salad is best when served very cold, but if you make it too far in advance, the dressing will separate. The best thing to do is to prepare both the cucumbers and the dressing and keep them chilled until you're ready to serve. Combine them at the last minute, and this salad is ready to enjoy. Halve the cucumbers lengthwise and scoop out the seeds. Cut into 1/2-inch slices. Toss the cucumbers with the salt and set in a colander or strainer for 5 minutes while you prepare the dressing. Whisk together the sour cream, crème fraiche, sugar, vinegar, dill, parsley and pepper. Pat the cucumbers dry to remove any excess salt.